Fantastic! 2010 was the best chase season I've experienced yet! Not only did I see the most tornadoes I've seen in the single year (17 in 6 different states on 6 different tornado days), but I also saw the largest and most powerful tornado I've seen to date, the Bowdle, SD wedge tornado. Overall the 10 day chase saw 8 chase days total, and one of the two off days we chose not to chase in order to reposition ourselves for better days later that week. The Bowdle chase day was my all time favorite, from the forecasting, to arriving under the triple point and watching towers try to break the cap, to probably the best tactically executed chase day I've been involved in, paying off with 6 tornadoes including an extreme close-up of the wedge tornado. This year also resulted in two very close calls with tornadoes, especially in Oklahoma on May 19th when the chaser congestion reached dangerous proportions, first narrowly missing being hit by a developing tornado, then waiting helplessly as a rain-wrapped meso known to be producing a tornado approached, with the escape road completely blocked by a certain TV show's crew displaying a total lack of concern for the safety of those around them. There are a lot of folks out there who think they LIVE in a reality show! 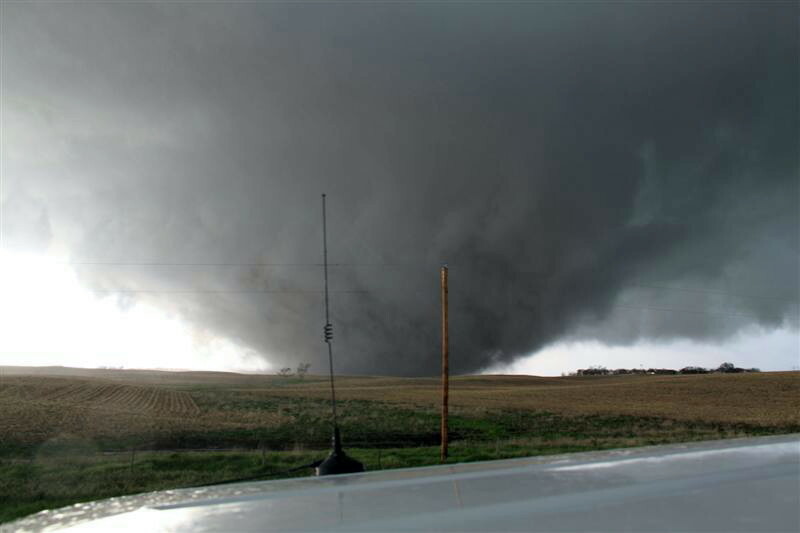 May 22th, 2010: Fantastic chase day including the Bowdle, SD wedge tornado and 5 others. Best chase day of my 10 year chase career! May 24th, 2010: Spectacular mammatus display in Valentine, NE on the 24th. May 25th, 2010: Awesome surprise tornado near Bartlett, CO in extreme Southeast CO.